Incident Details: A lady walking with her partner, slipped and suffered a serious ankle injury. The Team set off to Rosthwaite with two vehicles. 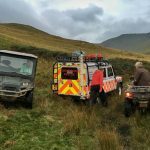 The Great North Air Ambulance was scrambled from Langwathby, but because of the difficult terrain was forced to land at the foot of the hill, and wait for the Team to treat the lady and stretcher her down. She was given analgesia and splinted ready for the carry down. As there was going to be a significant delay, Helimed left once a land ambulance arrived on scene. The lady was transferred to the ambulance at Hazel Bank, and was then taken to the Cumberland Infirmary by road for treatment. The Team then gave her partner a lift back to his car so that he could follow her to hospital.